INCIDENTAL COMICS: There will be no encore. Brilliant! I love the rhyming scheme here, and am always a huge fan of your artwork. Normally I don't like to comment after everyone else has, so I tend to keep my similar praises to myself...but this time it looks like I am close to the top! 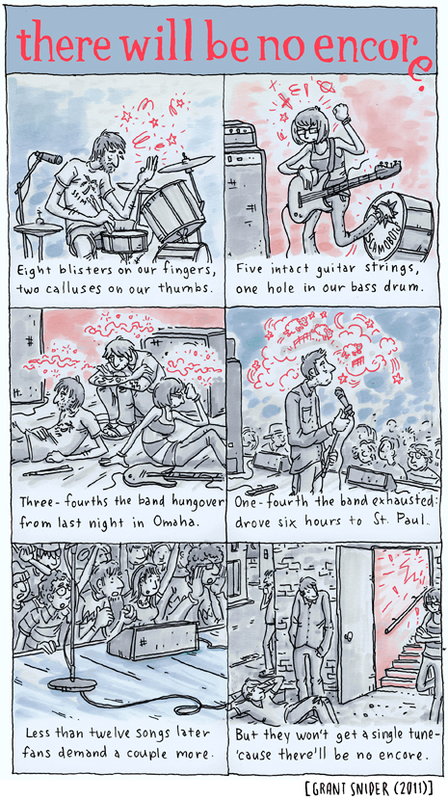 My favourite panel is 'five guitar strings intact, one hole in the bass drum' (paraphrasing...) but I played guitar and drums in my old band, and the broken strings were a pain! PS my captcha is 'sperm'. That is all. Nice blog, hi friend, i found that there is one website offering free puzzle game. Just take one minute to sign up then you will receive one free puzzle game. I've done it and now i am enjoying it. Its URL is http://www.684899.com/en/CosmicCreature/project_1.htm Click the below button of the page to get in. I've done it and now i am enjoying it. Thank you, dysunction! My college roommate played a bass drum with a hole in it. Cheapest kit ever. Maybe captchas are finally evolving a sense of humor! Ladies and gentlemen. Grant Snider has left the building.